I've always thought that Benefit products are overpriced for what they are but whenever there is an opportunity to try products from this highly acclaimed San Francisco brands I always take it. Randomly in Boots a few weeks ago they were selling travel size versions of the; 'they're Real!' mascara for £9.50 - slightly steep for a travel size product but it meant I could try it before potentially wasting my money on the full size version (if I didn't like it. The 'they're Real!' mascara claims to; lengthen, curl, volumise, lift & separate the lashes as well as having a formulation that is super black, long lasting and doesn't smudge or dry out. 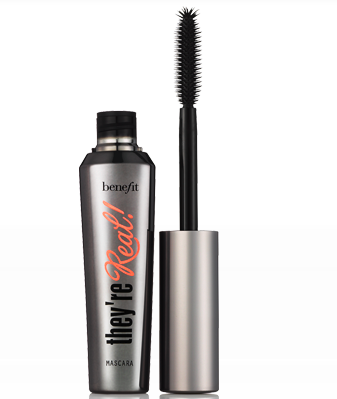 As with most Benefit products the packaging of this mascara is fun & quirky without bordering on the scale of tacky. I think what make's this mascara so unique is, its brush and that's what I talk about mainly in this review. The plastic wand is unlike any other mascara wand i've seen. A specially designed brush with tiny bristles allow you to get right down to the roots of your lashes to achieve separation & volume without the hassle of real false lashes. The top of the wand is slightly tapered so you can to get to those tiny lashes in the inner corners of your eyes as well as helping to coat the bottom lashes too. Despite this mascara being unique for its wand I did find that it did irritate and scratch against my eyes at times and because of that it took time to work with the mascara. The formulation is completely different to the 'BAD Gal Lash' mascara, its wet, but not too wet if you know what I mean and is just the right consistency. It's pigmentation is really strong and gives the blackest of black lashes. My only problem with this mascara is getting it off, and I know many people have expressed this problem too. It just won't budge, even with my holy grail eye make-up remover (Garnier Simply Essential Soothing 2 in 1 make-up remover) it can be very problematic with signs of residue in the mornings and no one wants 'panda eyes' do they ? So the question is; would I purchase this mascara at fully price? The answer to that would be a big fat NO. Although I really liked the effect it gave to my lashes it didn't do anything more than other mascara's I've used to warrant paying the £18.50 for a full size. The fact that it's also a pain to get off also puts me off because the more I have to rub my eyes that more I feel I'm doing damage to my lashes - does anyone else feel like this too or is it just me being me weird? If you've used or are using Benefit's they're real! mascara let me know what your thoughts are by leaving a comment below.